So many internet marketers get easily beat down when it comes to using Twitter in the right way. To be successful as a business tweeter, it is important to realize that the business way of using twitter is different from the personal way. According to Twitter.Inc, every day about 500 million tweets are exchanged between the twitter users. So in this huge network, the only thing that can make you outstanding on twitter is the way in which you send tweets to the followers. So you might be wondering what you could possibly do to engage your twitter followers and convert them into regular customers. Read on you will know. Twitter is a great social media platform for any business to quickly share updates across people around the globe. Moreover, twitter is a business intelligence tool for the businesses to gather intelligence in terms of feedback from the customers, clients, and prospects. Retaining customers is something that every business thrives for. Twitter in this case is an excellent media to build strong relationships between prospects and customers. When you are able to gather information and analyze it to know the current customer behavior for making future planning, then you are on the right path to achieving goals. Twitter is a great fit for those businesses who want to build reputation of their company and eventually turn it into a word of mouth among the target customers. To get the most out of the twitter marketing, all you have to do is follow the below 10, organic twitter advertising rules. Brand Awareness is the most obvious advantage every business likes to gain through twitter. To get there, tweet messages with an attractive company logo having name on it. This will let the people recognize the name of your company and spread information about your products. Twitter can be used for direct consumer marketing. For this, you need to tweet messages containing specials, promos, and announcements that will encourage people to contact you by email or through your website. Whatever offers or promotions you provide will pull people in to your business. Twitter can be a great tool for offering customer service. Many companies are answering FAQs on twitter and are solving common problems among the large audience. For instance, the Comcast is the software company that has used twitter to its best for providing 24-hour assistance by answering frequent called problems or issues of the customers. Doing this is not a liability. It can generate leads and sales for the companies. Twitter is helpful in building relationships with potential customers by adding them to subscribers list. Larger the number of followers in your twitter account, greater will be the chance of encouraging people to buy things. You can send sales messages on a regular basis to the subscribers and this can be your effective sales machine. Twitter is a great tool for providing instant updates and alerts to clients and customers. Most of the businesses today need to stay connected and communicate with each other on a continuous basis. Twitter is an excellent way to do this. Twitter can be used for sending news about the upcoming marketing events that your company organizes. By using features such as retweets and hashtags within the twitter, one can market the event and bring in people for the event. This could also lead people to follow you and expect to hear big announcements about the coming events. The twitter users usually get curious about the hashtag and click on the links to learn about it. Twitter is a great platform for conducting market research. Simply ask questions about your products and let the customers and clients reply about what are their desires and needs. You can also sneak into the competitors twitter page and see what their customers are demanding and try to make strategies to deliver the same. If there is a crisis in the company, then twitter can be a great way to employ the damage plan. The viral nature tweets and retweets can help you to progress information at a faster pace among the followers and let them know about it. Twitter can be used to entertain your followers. You can send interesting messages, articles, and funny tweets that can entertain customers, clients, and prospects. Including a bit of controversial information has always worked well in keeping the followers high. Overall, this builds strong relationships to sell and market products. If you are not still aware, social media networks such as Twitter has a great role in increasing the organic search engine rankings. Google will be happy to place you at the top when it finds good social signals from your followers. This means, with a twitter account that has a good number of followers interacting every day with you have a better chance of being ranked higher in the search engine results. There you have it, all the ways by which a company can use Twitter in a business sense. There are many other advanced strategies and techniques about Twitter which will be covered later. Thank you! Twitter has become a powerful social network nowadays. It has impressed people with its unique take on social network websites. Twitter can be a great way to drive people to your website and blogs. However, just like other social media sites, you need to be able to utilize the functionalities of Twitter effectively. You may have tried using Twitter to bring in more traffic to your websites but saw that it was ineffective. You need a proper marketing strategy if you are to make use of Twitter as a viable marketing tool for your business. At first, it may seem that it is difficult to get the traffic diverted to your website via Twitter. However, by implementing a few tips, you will notice your website is getting a lot of traffic hits from Twitter. 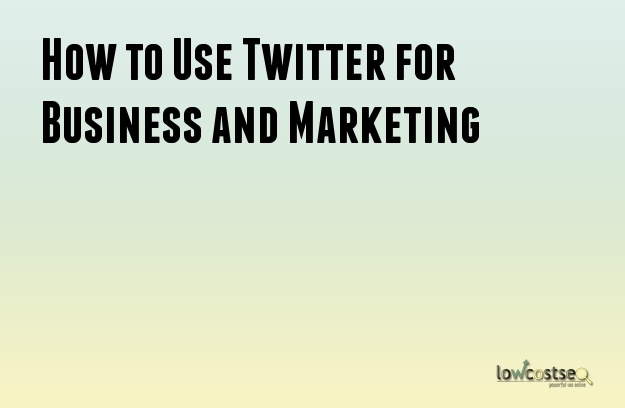 These easy tips use the functionalities and features of Twitter itself to your benefit. There is nothing more attention grabbing than images and Twitter allows its users to post them. People like images and their love for them is shown in the huge numbers of images that are tweeted every day. If you post an image that is interesting and attractive, people are going to re-tweet it and share it with others. By posting images, you are bound to catch the attention of your followers. However, you will have to make sure that the images are related to the content you are posting or linking. If done correctly, a lot of traffic is going to end up at your website. Twitter is a micro blogging platform. People want content that interests them. If they enjoy the content, they are going to share it with others. Therefore, keep the content interesting whenever you are linking it. However, simple interest is no longer enough to get a lot of shares. They should be informative and prove to be of use to the reader. The content should make a strong impact on the readers and if possible compel them to try out the services you offer. A Twitter button should always be placed near your content to let the readers tweet about it easily. The best way to make your content interesting and irresistible is to create a strong headline. The headline should make the readers want to read the content further. You can post the headline along with the link to the content on Twitter. An arresting headline will make the readers visit your website to read the rest of the content. It does not matter if your content is interesting because the people will not read it if the headline does not catch their attention. You should encourage your followers in Twitter to share your content. They will, of course, if the content is interesting to them. However, there is no harm in gently requesting them to share. The easiest option would be to add a social media button for Twitter to the content. Twitter can be a great way to interact with your customers as well. In fact, you can make use of this social network in many ways.